Check out 20 traditional outfits ideas and select from this stunning collection to celebrate Eid in style! Eid is coming and so the preparation begins! Picking up the finest outfit for prayers and the big feast can get a bit tricky. So this time, why not try out something which is trendy? A sharara, gharara, lehenga or a Pakistani suit that represents all new designs, with a stunning hairdo, mehndi clad hands and beautiful makeup. Accentuate your eyes for the daytime festivities as well as the evening get-together. Zuri brings to you 20 traditional outfits with a modern twist. In pastel shades, dark colors, heavy resham embroidery or just a simple mirror-work on the lowers, done on georgettes, cottons, crepes, nets and chiffons or any other fabric of your choice. So, this Eid, look pretty and elegant by choosing the right outfit for yourself. Whether you prefer styling yourself in a simple manner or want to go for something extremely elaborate, we have got an outfit to your liking. If you are looking for a heavy outfit, then opt for a sharara in net with sequins and thread-work. You can team it up with an organza or a net dupatta with similar embroidery. The kurta has to be short (knee-length). An embellished gharara or a saree with a heavily embroidered blouse is also bound to look amazing for the festivities. These days, gotta-patti on nets and georgettes is also trending. If you are quite tall, here is a splendid outfit for you. A long collared jacket with sharara pants! Go for dark colors if it’s a night time celebration at your side. A green, coffee brown, peacock blue, fuchsia pink or a maroon perhaps can be ideal. Wear bright makeup and a bit of a glitter as an eyeshadow. For the daytime dressing, it is recommended that you opt for a simple lehenga with light embroidery. 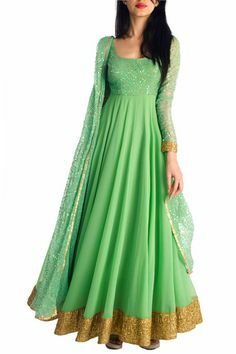 How about an Anarkali suit with a boat neck and gorgeous resham embroidery on it? Team it up with a churidaar or a flowy skirt (lehenga) in a color that is represented through resham embroidery. Ladies! Here are 20 amazing traditional outfit ideas to draw your inspiration from. This Eid, look spectacular as you celebrate the festival with great fervor.